#FabulousFridayGuestBlogger, Deborah Jay: how do you write ‘what you know’, when you write fantasy? Thanks, Marcia, for the opportunity to be featured guest blogger here on The Write Stuff this week. I’m so thrilled this wonderful blog is up and running again after all your trials and tribulations. We missed you! ‘Write what you know’ is one of those rules all authors come across. But when you’re writing a fantasy novel, how can you do that? One of the draws of writing fantasy is the ability (necessity) to create your own world from scratch, but it’s nevertheless important to have enough similarities with the real world for readers to have an easy frame of reference. If everything is unfamiliar, they have to work too hard at understanding what’s going on to enjoy following the plot, or find empathy with the protagonist and supporting characters. If I’d wanted, I could have given my characters 6-legged, horned critters to ride, but as a professional horse rider (my day job, lucky me), I decided to give them regular horses. Well, slightly enhanced, almost regular horses! At this time of day, only one horse stood inside. Fleetfoot, Rustam’s bright bay Shivan stallion, dozed on his feet in the middle of the walkway, disdaining an actual stable. None of the stable lads would dream of trying to coax him into a loose box—he’d shown them how such an attempt would end within half a day of his arrival in the barn. Fortunately, as the season was so warm, the lad in question had dried out quickly after his dunking in the water trough. Fleetfoot arched his neck, lowering his head until he matched eyelines with Rustam. His expression revealed both dismay and disapproval. Rustam shook his head. “For someone who can’t utter words, you have an amazing ability to express your opinions. You think Risada should come with us, don’t you?” Fleetfoot bobbed his head down, once, twice. Each of my books features several named horses who have their parts to play in developing the characters of their riders, instead of being just a means of conveyance. I find human/horse (or indeed, any animal) relationships bring out greater personality depths, and in the case of horses are often a means of strengthening and deepening certain traits, such as patience, empathy and humility. Exactly what they do for those of us fortunate enough to work with them in real life. DO you follow the ‘write what you know’ rule? Please tell me in the comments: it’s always fascinating to hear other writers’ thoughts on the ‘rules’. Each book has a stand alone story arc, but they have ongoing threads leading towards a final showdown in book #4. Living mostly on the UK South coast, she has already invested in her ultimate retirement plan – a farmhouse in the majestic, mystery-filled Scottish Highlands where she retreats to write when she has time. Her taste for the good things in life is kept in check by the expense of keeping too many horses, and her complete inability to cook. She has a dream day job riding, training and judging competition dressage horses and riders, and also writes books and magazine features on the subject under her professional name of Debby Lush. If you fancy trying out a FREE Five Kingdoms story, sign up to my mailing list HERE – you can always unsubscribe if it’s not to your taste. As no one else seems to have claimed today, I thought I would share a short review for the first in my Five Kingdoms series – short, but lovely. “I’m a great fan of a fantasy novel and this book is such a gripping read that I could hardly put it down. I thought the plot and unfolding of each character very imaginative and the authors writing style really allows you to visualise each character and draws you in to the story. What if the magic that could save your loved ones condemns you to death? Rakish royal spy, Rustam Chalice, loves his life the way it is, so when the kingdom he serves is threatened from within, he leaps into action. To his dismay the spymaster prince teams him up with an untouchable aristocratic assassin. And to make matters worse, she’s the most beautiful woman in the Five Kingdoms. Plunged into a desperate journey over the mountains, the mismatched pair struggle to survive deadly wildlife, the machinations of a spiteful god—and each other. When Rustam discovers he has magic of his own, he is forced to question his identity, his sanity, and his loyalty to his prince. For in Tyr-en, all magic users are put to death. The Prince’s Man is the first book in The Five Kingdoms epic fantasy series. If you like action, intrigue, and magic, spiced with a touch of romance, then you’ll love Deborah Jay’s vividly realised characters. A lifelong fan of science fiction and fantasy, she started writing her first novel aged eight, and has never stopped. Her first published novel is epic fantasy, THE PRINCE’S MAN, first in the Five Kingdoms series, and winner of a UK Arts Board award. #2, THE PRINCE’S SON is also available with THE PRINCE’S PROTEGE due soon. Her first urban fantasy, DESPRITE MEASURES, about a Scottish water sprite, is the opening novel of the CALEDONIAN SPRITE SERIES. The companion short story, SPRITE NIGHT is available FREE on most ebook retailers. Sign up to Deborah’s newsletter HERE and receive a FREE short story in the Five Kingdoms series! Hi Marcia and all – waves from the UK. I hope you all had a great Christmas? For me it’s all about joining up with the family and taking time off work without feeling guilty. The best thing is, after Church, my sister-in-law cooks the best ever goose with all the trimmings – a huge blessing as any of you that have read my bio will know that I can’t cook!!! I set up a WORLD WIDE SALE for the Christmas period, $0.99 (or the equivalent) for my award-winning first in my epic fantasy Five Kingdoms series, THE PRINCE’S MAN, and as it’s gathering pace, I’ve decided to let it run on into the new year. So until January 4th, if you haven’t already indulged, why not grab a copy at this tiny price? It has to be said that Tolkien causes problems. Quite apart from being so addictive that, once read, you are likely to go back and read the books again, you may never find anywhere quite as rich as Middle Earth within the pages of another book. 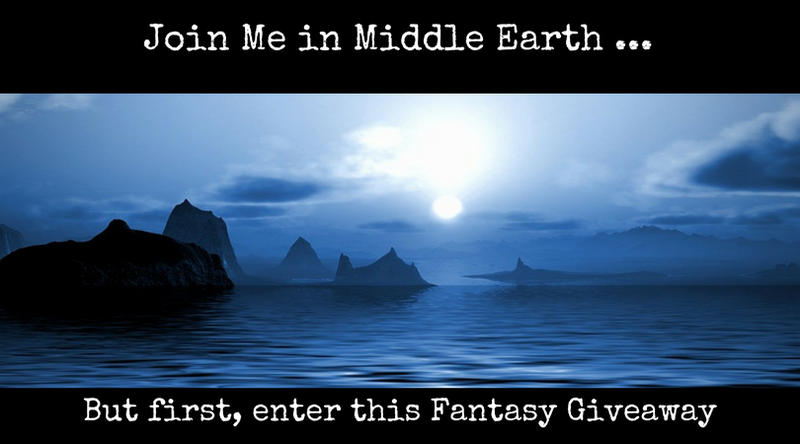 Anyone whose introduction to fantasy is via The Hobbit and Lord of the Rings, will have a fabulously detailed, multi-layered and multicultural world permanently established in their imagination. Especially if you go on to read The Silmarillion too and become aware of the rich complexity and authenticity of the languages, histories and mythologies he created as the backdrop for his world. Tolkien’s elves, orcs and wizards will quickly become the standard by which all others are judged. The sheer scope of the story means that just about every possible trope is used, and every mythical or magical species is covered, along with a goodly armoury of magical weapons and the central motif of the Ring of Power. Is there any reason to read or to attempt to write fantasy any more? It is almost impossible to write high fantasy these days without being accused of stealing ideas from Tolkien. For aficionados of Middle Earth, it is even harder to read fantasy without drawing comparisons. While creating what is arguably the best fantasy ever, the author has also inadvertently ruined the very genre he brought to popularity. Our teacher read The Hobbit to the class of eager listeners in junior school, but I did not read Lord of the Rings until I was in my teens. Even though the Narnia stories of C.S. Lewis were already so well-thumbed that the books were disintegrating, it was not until I read Tolkien that I heard of fantasy as a genre. There were only stories, fairytales, myths and legends. Oddly enough, that did not stop me from enjoying them all equally. I was reading tales of giants and talking trees, elves, trolls and goblins long before I came across hobbits. Although perfected by Tolkien, the lineaments of such characters were already drawn in my mind by the fairy-tales of early childhood. The quest is a familiar concept in myth and Excalibur is surely the most famous sword with which to prove kingship, even more so than Andúril, while the popular version of Merlin must surely outrank even Gandalf. The first officially designated fantasy I read after Tolkien was Stephen Donaldson’s Lord Foul’s Bane, the opening book of the Chronicles of Thomas Covenant. Lo and behold, the hero, Covenant, had a magical ring whose powers could save or damn the world. The ring was both feared and sought by the dark Lord Foul as Covenant traversed a land peopled with both characters and situations that could have been lifted directly from Tolkien. The parallels are striking in places, from the tree-city to the goblins, the extra-special horses to the healing vegetation. Yet the writer managed to make me forget all that by his creation of the Land. This is no Middle Earth… and the parallels that at first seemed gratingly familiar, soon diverged and developed into a rich tapestry of a tale with its own unique character and ‘feel’. Other fantasies followed, each creating a landscape and feeling entirely different from the last… and each sharing something with the reader that was unique in spite of a common heritage. The truth is, we cannot blame it all on Tolkien. He himself drew heavily upon myth and legend, particularly the Norse myths. Most of the characters and storylines he uses so magnificently are familiar from our oldest tales. Even the Ring was not his idea. Odin, the Norse god, had a magic ring, although admittedly, Draupnir was an arm ring. Plato speaks of the Ring of Gyges that conferred invisibility on its wearer. Wagner’s Ring Cycle tells the story of a magical ring whose power resides in the ‘denial of love’ and can bring the entire world under subjugation. And every mythology has its Dark Lord in one form or another. Fantasy is not just a way to escape reality for a while, it offers a means of exploring, understanding and explaining it. The battle between ‘good’ and ‘evil’ is something we see played out on both the world stage and within our own natures every day. The sustaining qualities of the Quest, such as loyalty, endurance and vision, are those that serve us, while the betrayals and obstacles mirror our own. Just as stories reflect our own so do our own lives reflect the greater life around us. Just as we played at being grown-ups when we were children, fantasy allows the mind to experience a new mode of being in a symbolic landscape that can enrich our lives and present us with questions we might never otherwise consider. Without realising, we may learn much from a well-crafted tale. Does it matter if it has been ‘done before’ no matter how brilliantly, when all our stories follow threads that lead back to the beginning of mankind’s fascination with storytelling? Stories have always taught through entertainment, by capturing the attention and imagination, engaging the emotions and settling themselves firmly in memory. Each tale appeals to something within us that answers with its own voice. Every storyteller brings something of themselves, something unique, to the tale.